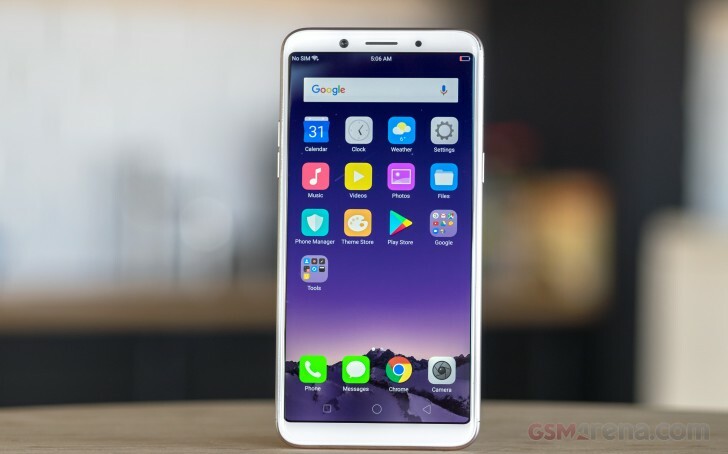 We already praised the Oppo F5 for its slim front bezels. The company's choice of a FullHD ultra-wide panel, over a cheaper 720p one is also appreciated. Granted, the F5 is far from the only option out there to ship with the trendy new aspect and 1080p resolution in the sub EUR 350 price group. There is the Huawei Mate 10 Lite, also the Honor 7X and the LG Q6. So, there is no real exclusivity to Oppo's 6-inch, LTPS IPS LCD display. It is still a solid panel, though. With 402 ppi density, it looks perfectly sharp. On a pixel level, we find a standard RGB arrangement. Performance-wise, it has excellent contrast, thanks to really deep backs and trumping most everything else in its price bracket, shy of the Super AMOLED Samsung Galaxy J7 Pro. It scores top marks in brightness as well. The Oppo F5 also has a max auto mode. In bright direct sunlight, its brightness can climb a bit higher still. Sunlight legibility is also good. Nothing to phone home about, though. Good color accuracy readings put the final touches, in what is shaping up to be a really solid phone display. While we have definitely seen better, an average deltaE of 5 and a maximum of 9.4 are still very good scores. The F5's color pallet is actually pretty balanced overall. The biggest variance seems to come from the whites, which all have a distinct blue tint to them. Unfortunately, due to the lack of any color modes of white point tuning options, you are pretty much stuck with these colder tones on the F5. The Oppo F5 packs a decently sized 3,200 mAh battery, just like its F3 predecessor. 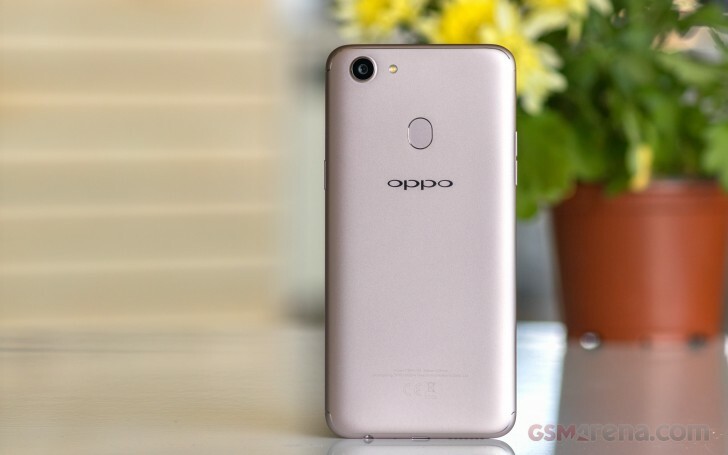 It is not a battery beast, by any means, but to reiterate a previous point, the new plastic body has allowed Oppo to keep weight down at 152 grams, even with the same battery capacity and a larger display. Also, we went into the battery test segment with high hopes for any potential endurance improvements by the new MediaTek Helio P23 chip. Still, we can't realistically expect an amazing difference over the Helio P20, since both are based on the same 16nm TSMC fabrication process. As expected, the numbers show the new Helio P23 is just as frugal as its older sibling when it comes to battery life. It scored a great endurance rating of 91 hours, with good scores across the board. Well, video playback could use use some extra optimization. But other than that, a very good score. Also, one that falls in line well with expectation. For instance, the Sony Xperia XA1 Plus leveraged its Helio P20 chipset and 3,420 mAh nattery well enough to score a 102 hour endurance rating. The slight bump in battery capacity mostly went towards improving standby performance. All the on-screen tests, as well as the call one come really close to what we measured on the Oppo, so a nice consistent and impressive showing from MediaTek's 16nm mid-range chips overall. Charging on the F5 is limited to a simple 5V@2A current. Just like with the F3, VOOC was apparently way out of budget. It is definitely missed, though, since Oppo's fast charging solution remains one of the best on the market. With its bundled 5V@2A charger, the Oppo F5 goes from 0% to 49% in half an hour. Not bad. While the new Helio P23 comes really close to the older P20 in CPU terms, it does offer a few notable improvements in the connectivity department. With it, MediaTek wants to somewhat bridge the gap between its higher-end solutions, lithe the Helio X30 and the mid-range, by providing some meaningful network improvements. The Helio P23 supports Dual 4G LTE and DSDS (Dual SIM, Dual standby) on both its slots, but also Dual VoLTE/ViLTE. That means both SIM cards can take advantage of high bandwidth data transfer and crisp audio calls. Given the proper PR and exposure, this could serve as a major selling point for the Oppo F5, especially in markets with a 4G-only infrastructure. As far as specific numbers go, the Helio P23 is rated at Cat.6 LTE, with a theoretical maximum of 300 Mbps down. You also get 20Mz + 20Mz carrier aggregation. According to our findings, there are actually two variants of the Oppo F5. One has a total of 12 LTE bands and four HSPDA ones, while the other has 9 and 3, respectively. On the local side of things, the Oppo F5 has Wi-Fi a/b/g/n, Bluetooth 4.2 and LE profiles. There are also a GPS and an FM radio receiver. No NFC, though. The microUSB port does support OTG (you do have to toggle it in the settings), but is only capable of USB 2.0 transfer speeds.